Stacy Horn » Blog Archive » Who sang it better: Maria Callas or Renata Tebaldi? Who sang it better: Maria Callas or Renata Tebaldi? This post is inspired by Mavis’s recent comments about the sopranos Maria Callas and Renata Tebaldi, and who stayed on pitch. This was always (and maybe still is?) a huge debate, I gather. When I was researching the subject of audio forensics I learned about a fascinating experiment regarding this very question. Briefly, the field of audio forensics began in the late fifties and early sixties when the NYPD asked scientists at Bell Labs for help identifying who was telephoning bomb threats to a number of airlines. Using something called a spectrograph, Dr. Lawrence Kersta made visual representations of the phone conversations. These pictures are called voiceprints. Kersta had assisted in their development during WWII, when the military was looking for ways to identify enemy voices over the radio. Kersta pronounced voiceprints as distinctive and reliable as fingerprints for identifying people, and he left Bell Labs to form his own company. The field of audio forensics was born. Kersta was involved in many famous cases in his lifetime, including the Kennedy assassination, the Clifford Irving Howard Huges hoax, and in 1969, when rumor spread that Beatle Paul McCartney was dead and replaced by a look and sound-alike, Kersta compared voiceprints from older recordings of McCartney to ones that were current and determined that Paul was very much alive. But one interesting thing Kersta discovered was: people can be as unreliable about recalling what they heard as they are about what they saw. We know many people have been falsely convicted based on eye witness testimony. Apparently ear witness testimony can be just as iffy, and people don’t always hear what they think they heard. I interviewed Tom Owen, an audio forensic examiner certified by the American College of Forensic Examiners. He was also once the Chief Engineer for the Rodgers and Hammerstein Archives at Lincoln Center. He told me how he used Kersta’s spectrograph to compare the high C’s of Maria Callas and Renata Tebaldi. Of course Mavis’s larger point was, Tebaldi’s high C may have been pitch perfect, but Callas’s was more artful and beautiful. One more thing, I visited the Bell Labs archives and the curator was kind enough to dig up an old Bell Labs promotional film called “Science Behind Speech.” This is Lawrence Kersta demonstrating what a spectrograph does. 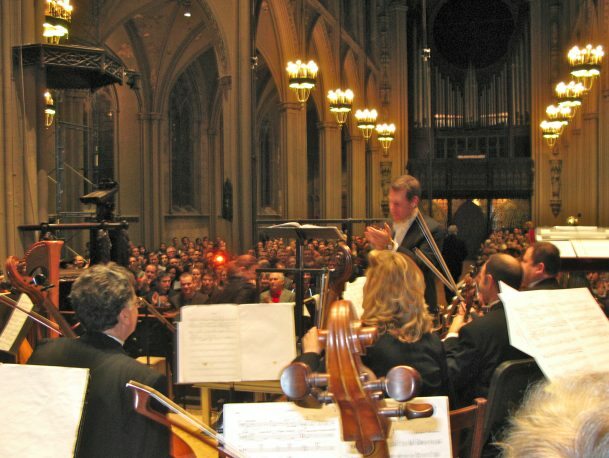 A shot of conductor John Maclay and the orchestra and audience after one of the Choral Society of Grace Church concerts. Thank you! It was very absorbing to research. It’s amazing. People will swear they said something, or that someone else said something, and when you play it back for them, some people still insist. Actually, this played out last night on tv, on The Bachelor: The Women Tell All.